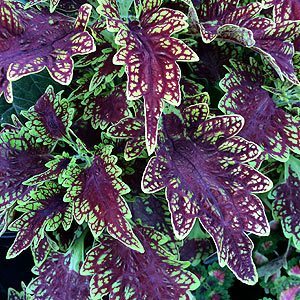 With more varieties available than ever, Coleus are also known as the painted nettle. They are a wonderful foliage plant and can be grown successfully outdoors as far south as Sydney. In cooler areas they are really an indoor plant except in warm sheltered positions. Frost is a problem so growing in pots in frost prone areas allows plants to to moved to a protected position. Many new cultivars have wonderful variegated foliage, however some also have brilliant single colours, a few great red varieties (see picture right) are available at present. 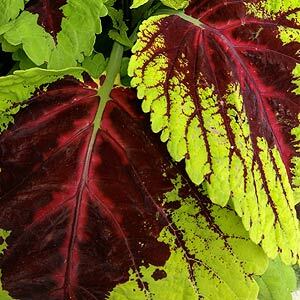 With new colorful cultivars such as Coleus sultana (pictured above right) with its large burgundy splashed foliage you can add instant color to the garden. Generally Coleus prefer a warm position with good filtered light is best and regular watering is essential, but be careful not to ‘over water’. These great foliage plants work well in hanging baskets, pots and planters as well as in the garden. The flowers are attractive to beed and insects. Protect new seedlings from snails and slugs. Water regularly with a liquid seaweed fertiliser, of use some slow release all purpose fertiliser as required. Plants can be pinched back to create more compact growth. Coleus (Solenostemon sp.) can be grown from seed, generally plant from spring to mid summer, in tropical areas all year round, in cooler climate try mid spring once the weather warms up. Spectacular varieties such as Coleus Kong Rose pictured above right has large foliage and brilliant splashes of green and red. Coleus are generally available for sale at garden centres during spring, seeds are also available from garden centres as well as online.